Saturn and its iconic rings, as seen by NASA's Cassini spacecraft. Humanity's light at Saturn has gone out. NASA's robotic Cassini spacecraft burned up in the ringed planet's atmosphere Friday morning (Sept. 15), ending a remarkable 13-year run at Saturn that has revolutionized scientists' understanding of the outer solar system and its potential to host life. "We left the world informed, but still wondering, and I couldn't ask for more," Cassini project manager Earl Maize, of NASA's Jet Propulsion Laboratory in Pasadena, California, said during a news conference Wednesday (Sept. 13). "We've got to go back — we know it." And various research teams are indeed working on plans to return to Saturn. In fact, five such concepts are in the running for NASA's next New Frontiers mission — the same type flown by the agency's New Horizons Pluto probe, Juno Jupiter orbiter and OSIRIS-REx asteroid sample-return craft. During its intentional death dive Friday, Cassini briefly became the first-ever Saturn atmospheric probe. One of the proposed New Frontiers missions would pick up on, and greatly extend, the last measurements Cassini ever made. "Fundamental measurements of the interior structure and noble-gas abundances of Saturn are needed to better constrain models of solar system formation, as well as to provide an improved context for exoplanet systems," principal investigator Amy Simon, of NASA's Goddard Space Flight Center in Greenbelt, Maryland, and her colleagues wrote in a mission description last year. Cassini studied Titan closely over the course of 127 targeted flybys. The Saturn orbiter also carried a piggyback European lander called Huygens, which touched down on the 3,200-mile-wide (5,150 kilometers) moon in January 2005. In the process, it became the first probe ever to pull off a soft landing on a body in the outer solar system. Observations by both Cassini and Huygens revealed Titan in all its otherworldly glory. Hydrocarbon rain falls from the huge moon's sky, pooling in lakes and seas of methane, some of which are as big as Earth's Black Sea. Complex organic chemicals — the carbon-containing building blocks of life as we know it — waft about in Titan's thick, nitrogen-dominated atmosphere and eventually drift down to the moon's surface. A proposed New Frontiers mission called Oceanus would investigate both of these environments, taking a variety of measurements from its perch in orbit around Titan. For example, the probe would characterize the organics in the moon's atmosphere and help researchers determine how thick and rigid Titan's crust is, and whether it is convecting internal heat to the surface. Oceanus "would follow up on Cassini's amazing discoveries and assess Titan's habitability by following the organics through the methanologic cycle and assessing exchange processes between the atmosphere, surface and subsurface," the concept mission's planners wrote in a description of the project, which they presented earlier this year at the 48th Lunar and Planetary Science Conference in The Woodlands, Texas. Also in the New Frontiers running is Titan Dragonfly, which would send a drone to study the moon from the air and the ground. "That means we can take a really capable lander and move it by a few tens of kilometers in a single flight, and hundreds of kilometers over the time of the mission," Turtle added. The drone would study the composition of Titan's organics in detail, at a variety of different locations. The other two Saturn-oriented New Frontiers proposals target 313-mile-wide (504 km) Enceladus, whose geysers were a revelation to the Cassini team, NASA officials and space scientists in general. "When we observed the southern hemisphere [of Enceladus] and geysers of water spewing out into the Saturn system, it amazed us and began changing the way we view the habitability — or potential habitability — of moons in the outer part of our solar system," Jim Green, chief of NASA's Planetary Science Division at the agency's headquarters in Washington, D.C., said at Wednesday's news conference. That's because the water in Enceladus' geysers is apparently coming from an ocean of liquid water that sloshes beneath the frigid moon's icy crust. Cassini observations suggest that this ocean may even have a chemical energy source that could support life as we know it. But researchers want to learn more about the ocean, and the geysers' plume provides a great way of doing so. One of the New Frontiers candidates, known as Enceladus Life Finder (ELF), would zoom through this plume repeatedly, collecting and analyzing molecules. ELF would look for complex organic compounds that could be a sign of prebiotic chemistry — or perhaps even of life itself. "It's free samples," principal investigator Jonathan Lunine, of Cornell University, told Space.com in 2015, when ELF was competing for a slot in NASA's Discovery program of low-cost, extremely focused missions. (In January of this year, NASA chose the asteroid-studying Lucy and Psyche missions as its next Discovery projects.) "We don't need to land, drill, melt or do anything like that." Not much has been publicly revealed about the final Saturn-oriented New Frontiers proposal. But its name — Enceladus Life Signatures and Habitability — suggests that it would also be a plume-sampling mission. You can learn more about all 12 New Frontiers candidates — the other seven of which would target Venus, a comet or Earth's moon — in this excellent synopsis by The Planetary Society's Van Kane. Will any of them fly? So, it's too soon to say if any of the Saturn-centric missions will ever get off the ground. But fans of the ringed planet may be heartened by one of Green's comments at Wednesday's news conference. Cassini's discoveries "will live on for many decades afterwards, and already they're beckoning us to go back," Green said. 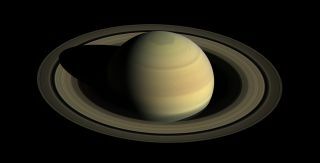 Between NASA's Voyager mission, which visited Saturn with back-to-back flybys in 1980 and 1981, "and Cassini was 30 years," he said, "and I believe that will be much shorter the next time around."